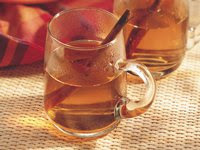 There's nothing like warm, spicy apple cider to break the ice when you're entertaining on a chilly day. In 3-quart saucepan, heat ingredients to boiling over medium-high heat. Reduce heat; simmer uncovered 10 minutes. Before serving, strain cider mixture to remove cloves and cinnamon, if desired. Serve hot. Calories 115 (Calories from Fat 0); Total Fat 0g (Saturated Fat 0g); Cholesterol 0mg; Sodium 5 mg; Total Carbohydrate 29 g (Dietary Fiber 0g); Protein 0g. Daily Values: Vitamin A 2 %; Vitamin C 2 %; Calcium 2 %; Iron 4 %. Exchanges: 2 Fruit. This entry was posted on 2:25 AM and is filed under Drinks . You can follow any responses to this entry through the RSS 2.0 feed. You can leave a response, or trackback from your own site.